(Newser) – Pope Francis temporarily expelled a German bishop from his diocese today because of a scandal over a $42 million project to build a new residence complex, but he refused popular calls to remove him. 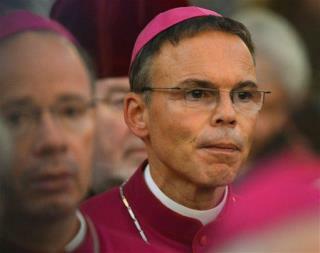 The Vatican didn't say how long Bishop Franz-Peter Tebartz-van Elst would spend away from the diocese of Limburg. But it said Limburg's newly named vicar general, the Rev. Wolfgang Roesch, would run the diocese during Tebartz-van Elst's "period of time away." In a statement, the Vatican said the situation in the diocese had become such that Tebartz-van Elst "could no longer exercise his episcopal ministry." F*CKER kinda looks like Sling Blade's Carl Childers. Like them french fried potaters. Mmmm Hmmm! Good for him (the Pope). This guy reminds me of Dennis Kozlowski, the former CEO of Tyco Corp, now a runway model for orange jumpsuits. Remember him ? The guy with the $2M Toga party in honor of his wife's birthday. The guy with the $5K shower curtain in his 5th Manhattan condo. Methinks they should check the Caymans and Zurich for the good Bishop's stealth accounts.